Last month I mentioned that I had started this book. I took my time with it, especially since it is broken into three separate tales. But, I’ve finished it now, so I thought I’d share! 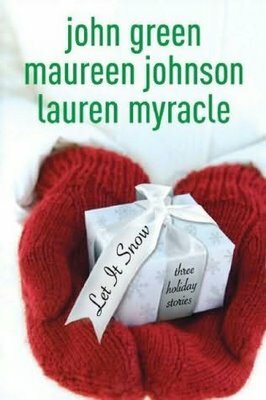 This is a collection of three holiday romances, which all take place in the same small town, during the days surrounding Christmas. The action point of these stories is a massive snow storm that hits on Christmas Eve. Although each story is written by a different author, and revolves around a different set of characters, all of the stories are interconnected at various points, and they sort of quickly come together at the very end. This is a good lighthearted read for the holidays. It is Christmas-centric, although some of the characters do not celebrate Christmas (and really the stories focus on the romances, not the holidays). Each tale is funny in its own way, and all three stories have a definite element of crazy unintentional adventure. My favourite story of the collection was the first one, written by Maureen Johnson. It’s about a girl named Jubilee who has to take a train on Christmas Eve, because her parents have been arrested (having been caught in a riot surrounding a rare release of a miniature Christmas town figurine). The train gets stuck on the outskirts of a small town, due to a snow storm. Jubilee eventually leaves the train and heads to a nearby Waffle House, where she meets Stuart, a nice boy who takes her back to his house to spend the night (in a very non-creepy way…his mom and little sister are present the whole time, and she sleeps on the couch!) …Both Jubilee and Stuart have relationship issues at the beginning of this tale, but by Christmas day, they find resolution in each other. This was my favourite tale because it was the most Christmassy, which was what I was looking for with this read. My least favourite story of the collection was Lauren Myracle’s, which was the last story of the collection. It is about Addie, a self-absorbed girl who cheated on her boyfriend and now is miserable over the holidays without him. From the other stories, you already know as a reader that her boyfriend, Jeb, has been trying to contact her, but was also on the broken-down train, and damaged his cell phone. But, honestly, I thought Jeb deserved better than Addie? So I didn’t care if she had her happy ending, really. Her story just didn’t speak to me. Overall, this is a good collection. My biggest gripe is that it had hardly anything to actually do with Christmas. None of these kids seemed even remotely interested in the holidays, which just didn’t speak true to me (both as a teen and now) or pretty much anyone I know. The story could have easily taken place in mid-January, and I think it would have been a bit better if it had. But aside from that, this is a good collection if you’re looking for some cozy reading when the weather turns cold! Yeah, I didn't realize they were connected until I started reading the second tale, so that was pretty cool. Glad to know I'm not the only one who hasn't read John Green! I want to read The Fault in our Stars, but I feel like I have to get mentally prepared for it first, lol! like to send you an email. I've got some ideas for your blog you might be interested in hearing. Either way, great site and I look forward to seeing it grow over time.